At least 73 people were killed and scores more injured when an oil tank truck burst into flames in a village in western Mozambique on Thursday, the nation’s public radio announced. “The death toll of the incident is now 73,” state-run Radio Mozambique announced, citing authorities in Tete. 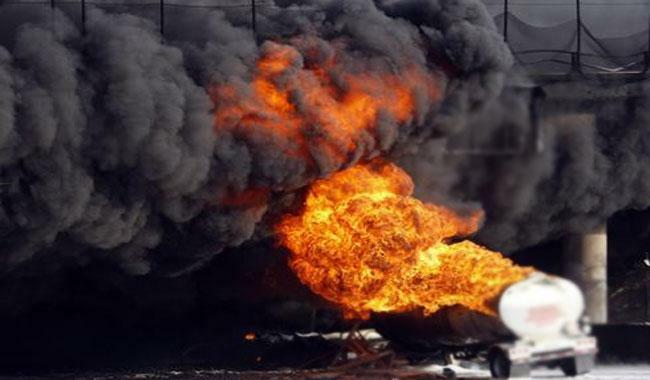 “The incident occurred when citizens tried to take petrol from a truck” in the village of Caphiridzange in Tete province, near Malawi, the government said in a statement. A local journalist told AFP the truck had crashed on Wednesday and exploded on Thursday afternoon, as scores of people tried to siphon off fuel. The government “deplores the loss of life… and is currently providing the necessary assistance in order to save lives and to comfort the victims’ families,” it said. Mozambique is one of the world’s poorest nations, according to the International Monetary Fund, and since its 16-year civil war ended in 1992 its population has suffered the consequences of a terrible economic crisis. The southeast African nation is also undergoing a new political crisis, triggered by the former rebels’ decision in 2013 to return to arms in order to push for a power-sharing deal with the government. The current unrest has pitted the so-called RENAMO rebel force against government troops in the centre and the west of the country. Among the provinces affected by the violence has been Tete, where Thursday’s blast occurred, pushing thousands of people to flee across the border to neighboring Malawi this year.